Well Disney Infinity has been released on the world. The question is, should you buy it or avoid it? The answer is, well, it depends. The first thing you should know is about the game. The game is based on toys that are released by Disney, you buy the toys put them on a base and they unlock in the game. It is very similar to Skylanders. The problem is you can not try this out before you buy, because of the link to the toys, it makes the ability to rent the game impossible. Another knock on the game is the price. The starter kit, which comes with the game, three figures and the base to connect to your system costs $75. Each individual cost about $15, the three packs are $30 and the two packs with a virtual playset are $35. To help with some of these costs, a lot of stores had deals on the sets and figures, but if you missed the launch week, most of those deals are gone now. The figures themselves are not actually figures, I would call them statues, but I will say I love how they look a mix of traditional Disney cartoon look and classic toy. The animated Pirates of the Caribbean is one of my favorite styles. So, how is the game, you are probably wondering? 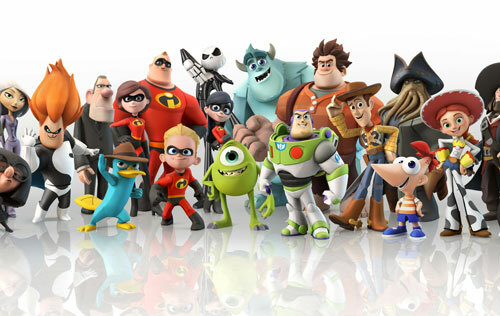 The games are fun, they are basically open world type games for each movie, the ones available now are Incredibles, Pirates, Monsters University, Cars and the Lone Ranger. There are a ton of collectibles to find and unlock, the only hang up is each figure can only play on their world. So Jack Sparrow cannot play on the Incredibles world and Mr. Incredible cannot play on the Pirates world. Also within each world there are certain things that can only unlock from certain characters, so to unlock those, you have to go buy more figures. that is how they milk you for more money. There are also power discs, but these are not essential to win the game, and the discs are sealed in a package so you never know which ones you are getting. If you bought 3 power disc packs at $6 a piece you could get 3 or 4 of the same, which could make you a little angry. The other mode is the Toybox mode. This is a world builder type mode, all the unlockables you go tin the other worlds can be used here. You can make any world you want, some notable worlds that could be possible are a Alladin, Ducktales or even a Tangled world. You ave total control over and world you make. Also you will have the ability to download other worlds from online that people have created, it is a lot like Little Big Planet in this regards. So who is this game for? Well anyone with kids who love Disney. In my case, I have a 9 year old daughter and she loves it. Another could be the collectors out there, the figures do look cool, and even if you do not like the game, the figures are cool enough to display. It is a big money sink, but you could just buy a starter pack at $75 and win each level without ever buying another figure. But when your kids want new characters and you inner child comes a calling, it will be hard to resist buying more! This entry was posted in Nintendo Wii, PC Game, Play Station 3, Reviews, video game, Xbox 360 and tagged Disney, Infinity, PS3, Wii U, Xbox 360. Bookmark the permalink.